The Chassis is the most important part of an automobile, when it comes to safety and loading measures. 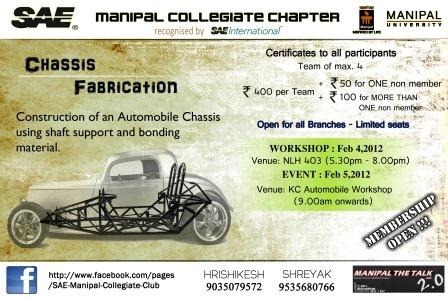 SAE is conducting a Chassis Fabrication Event on the 4th and 5th of February. 4th will be a demonstration/ Workshop with the help of a prototype, supported by Catia and ANSIs. TAKE AWAY KITS TO BE PROVIDED.